Long pimples with a very large interference effect. Sparsely located small pimples to create disturbing effects. Just exellent for the blocks close to the table and the classically defensive game. 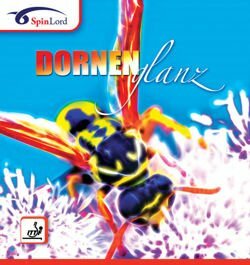 The greatest strength of Dornenglanz's is the allround ability. Slightly faster than Zeitgeist.